Looking at the versatile eclectic panorama of 20th century Russian art one suddenly comes across a phenomenon, which might only be described as a revelation. Such is the art of Eva Pavlovna Levina-Rozengolts. Levina-Rozengolts (1898-1975) lived in an epoch when experience of previous generations seemed to be unacceptable and art was feverishly looking for new forms. 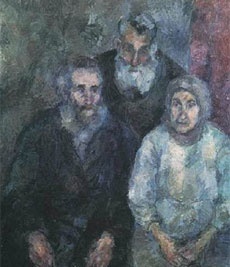 In music, that spiritual work was carried out by Dmitry Shostakovich, in poetry by Anna Akhmatova and Osip Mandelshtam, while in painting, among those well-known, were great artists such as Mikhail Vrubel or Robert Falk, as well as the less famous, but no less important painter Levina-Rozengolts. Her art will be a guide to the spiritual quest of the 20th century for future generations. The creativity of Levina-Rozengolts can be roughly divided into two periods: before her arrest and after it. A student of Robert Falk, Levina-Rozengolts started her artistic career as his follower both in manner and color. During the initial period of her work, one can find oils on canvas dating back to the 1930s. The Old People, for example, which was her diploma work at VKHUTEMAS (All Russian Higher Artistic and Technical Workshop), won her the rank of a first degree artist. Another work is Marusya, A Woman of Razyan. This first period also included early pastels – highly refined still lifes and Moscow city landscapes. The artist lived in the notorious Dom Na Naberezhnoi (House on the Embankment) where party bosses used to live and this dwelling allowed her interesting perspectives of Moscow. No matter how talented and harmonious these works were, they were created exactly in the manner of Falk’s school: the principle of painting from nature, traditional subjects (still lifes and city landscapes). Falk expected Levina-Rozengolts to create something large scale rather than just follow him in his footsteps. The student lived up to the hopes of her teacher after she spent 7 years in exile. The artist’s brother A.P. 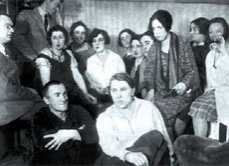 Rozengolts, People’s Commissar of Foreign Trade in the Communist Party’s Political Bureau, was executed in 1937 in connection with the prosecution of Nikolai Bukharin (1888-1938), one of the leaders of the Bolshevik Party and the first State of Workers and Peasants, while her other brother G.P. Rozengolts, a well-known microbiologist, was exiled to the town of Karaganda. For 12 years, Eva Pavlovna was waiting to be arrested. If she heard a car pass by her window she would lie on the windowsill looking out of the window. She was arrested after World War II in 1949 and exiled to the Krasnoyarsk region of Siberia. She worked for a lumberjacking company on the Yenisey River painting names on ships. In order to do this she had to be lifted up to a great height. To survive she also painted rugs and sold them out to the local people. But that was only part of her life there. In Siberia the artist discovered something that became crucial in her life: she found herself alone, face to face with nature – huge spans of land, water and uninterrupted panorama of the sky with its phantasmagoria of the ever-changing clouds. “I’m always on the bosom of nature and always alone,” she wrote in her letters home. One winter day Eva Pavlovna was working in the taiga when suddenly she saw an interlacing of naked branches against the background of a vast sky and realized that she had seen the rhythm that Falk kept talking about. Rhythm was a cult in art of the beginning of the century and for Falk it was a symbol of faith. This individual rhythm, which was suddenly discovered by the artist, opened up totally new pictorial opportunities for her. She began to imitate that rhythm on floral ornaments and that put an end to Falk’s system in her creativity. Paradoxically, as it might seem, Falk considered her “his only true student.” Levina-Rozengolts found her own individual relationship with the surface of the sheet, with the spot, with the line and with the light – all the components of painting were reconsidered by her, which allowed the artist to begin a principally new work. While in exile, the artist contemplated the hugeness of Earth, which gave her tremendous creative potential. Having no materials to work with, Levina-Rozengolts started drawing right on wet sand and these pictures were immediately washed away by the waves. She continued her drawing experiments in a cheap album and ordinary exercise-books painting with Indian ink and watercolors. In 1954 she got a permission to move to Karaganda where she could work as a theater decorator and a property person. Her real creativity began, however, when she came back to Moscow after her exile in 1956. She started working both with an irresistible craving to make up for the lost time and to overcome the pain. On the other hand she strived to say whatever she had to say. Luckily for her, Falk was still alive. He was shaken to see the new works of his student. “Eva Levina-Rozengolts is the only justifi cation of my teaching,” he used to say. From 1956 Levina-Rozengolts started working in Indian ink. Another big change concerned the form of her work – she began creating series, because the content of her art became so complicated that it spilled over the boundaries of one single closed image. The series were necessary to express new ideas and images, in which her creative thought could develop in time – from one sheet to the next. This new period started with the series, Trees – bewitched woods with naked dead trees whose branches entangle convulsively creating phantasmal rhythms and evoking a feeling of irreparableness – to be continued by the series, Bogs – tragic landscapes without a single human soul creating an impression of total aloofness from all living things. The powerful emotional influence is achieved by the subtlest transitions from black to white revealing a multitude of intermediary shades. This kind of space, which contains nothing but a shifting swamp with an occasional thorn in it, or air saturated with dampness, seems to have an endless stretch. Falk was astounded by these sheets: “This is something so perfect, so strong, and so incredible. These rhythms are so expressive. The forest now cries, now wails, now moans, now damns,” he said. At the beginning of the 1960s the artist started a new series: The Sky, which she continued till her dying day working in Indian ink and in pastels. She said she could hear and sing the melody of the clouds. The images in this series are diverse and yet they are all one. Like in Beethoven’s symphonies, their inner rhythm gradually develops from the increasing dramatism to culmination and abatement. The mastership in this series is astounding. It’s hard to believe that with such simple media as Indian ink, brush and pen one can create images of such emotional force, dramatic power and beauty – both conditional and realistically accurate. Looking at these skies with their transforming sailing clouds and the play of light and shade one starts thinking they are the real sky while the real sky begins to conjure up the visional images created by the artist. 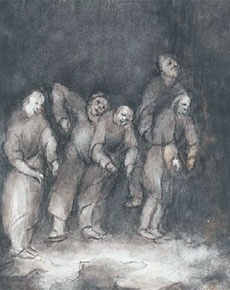 Even before The Sky series, Levina- Rozengolts had created the first drawings of her People series, which was named “rembrandtian” by art critic Mikhail Alpatov. The images in this series bring forth associations with such giants in art and literature as Shakespeare, Dante and Rembrandt. These generalized images – complicated and allegoric – create a polyphonic action of man’s life on Earth. These are not characters of the 20th century reality – they might even be Medieval or from earlier centuries while this lofty artistic language does not picture concrete situations, but speak metaphorically making one’s experience a flow of rhythms, gestures, movements and the magic transformations of light and darkness. That’s why, despite the tragic subject of these pictures, they evoke a purely visual pleasure of expressive form and perfection of mastership. The combination of black and white gives birth to an inimitable play of light whereas light is the most important means. Alongside the People series Levina- Rozengolts began another series called Portraits. The name is quite conditional for each portrait is a certain type, an incarnation of human qualities – wisdom, kindness, etc. After the Portraits series the artist continued the People series creating its second act, so to speak – Plastic Compositions. Unlike the “Rembrandtian” series in “Plastical” compositions the creative thought develops from tense dramatism and turbulent dynamics to searches of a way out – liberation. The characters in this series are not black and white anymore, but silver-grayish or light bluish. 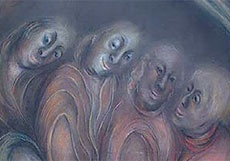 They do not look like people from Earth, but rather like spirits, i.e. people after death in diff erent bodies, more subtle than flesh and blood. They seem to have reached the Sky in the final sheet of the series – Serenity is upon them, the Kingdom of Clear Azure Light. Search for Harmony dominates the last sheet of the Sky series, which is – and this is common spiritual knowledge – not on Earth, but in the sky. People become lighter and happier on leaving Earth. Likewise in these landscapes, the Earth gives way to the sky. The first sheets of this series still contain a narrow strip of land dissolving in the rays of the light in later sheets until what is left is just the sky alone – solemn, lofty, bereft of earthly troubles. The Sky series was the finale of the artist’s creativity as well as her life. Levina- Rozengolts seems to have found her own sky, her heaven and left the earth happy and lucid. What is left for us is her great art, which, if we use medieval terminology, can only be described as a reflection of “light immaterial” and “unspeakable grandeur of Eternity” where every blade of grass is a Breath of God.